I agree, this shot is so innocent. This is such an amazing picture. Reminds me of the film Schindler’s List. Powerful. Can you follow her around for the next 20 years or more and photograph her? Great shot. Just terrific! Really strikes me. Lovely! I totally want to know if she has bangs. Cute cut. Oh la laa! What a little lady! Such a sophisticated pose. Adorable! What a beautiful and Romantic shot! Definitely tells a story! LOVE THIS PICTURE!!! Everything about this little girl is amazing…the hair, the pose, the dress…adorable! So glad you post pictures of children because they’re some of my favorite posts of yours! I love how children wear clothes; clothes never wear “them”. It’s style at its most pure. somehow this picture reminds me of a fellini movie. That pose exudes more confidence than a precious little darling like that should have. Amazing photo. She will be a force to be reckoned with in 15-20 years! I love this photo. Your black and whites are lovely! BEAUTIFUL. A Cartier Bresson for our time. Accept Our Appreciation and Ext. This has to be one of my favourite photographs of yours, the pose, the girl’s haircut, her dress, the sandals, the lamp…the arches…love everything about it! I love that this picture tells a whole story, the way she’s leaning against the lamp post is priceless, clearly observing something very interesting just out of the shot. This is such a precious picture. Lovely and romantic. Also, I’ve been rocking the same haircut she has since I was about her age. Scott- Have been loving the black and white, but this shot is simply wonderful. It is ageless; it could have been taken 50 years ago! Thank you! This is beautiful. Really enjoying the recent influx of black and white photos! She’s got it. Scott, you’ve got it. This young lady has got style without probably even knowing it. You always capture the essence of style, which essentially resides in your attitude, not in what (or who) you’re wearing. Wonderful! That’s such a gorgeous shot. It’g got such an old world charm! i like every pic here but that one has a wonderful pose! oooh, italien girl! love that pic. would like to have it on the wall. Everything is perfect about a child,but this photo is really amazing!A lovely memory…Μπράβο! I really like the pose of the little girl with Porta Ticinese in the background, amazing! What elegance! She owns the universe. OMG This girl is so cute !!! I really love this photo, so beautiful! Love this picture. It’s like a unforgettable moment of our childhood we couldn’t forget. oooo she is so cute!!! Moving, almost shocking. Wonderfull. A book within these limits would do justice to the photos. Reminds me of Sander & Kertesz, though very different from both. The quietness and tenderness of Kertesz, directness of Sander. Masterpiece. I can see a lot of sass in that pose! Great! I love this picture, so cute! Beautiful photo! Little girl is too cute! how cute is that! you have an amazing eye! Amazingly beautiful captured moment. Worldclass photo as usual! About a year ago I watched a documentary about your work. It was very interesting. Terrific shot indeed! She’s so small, but it’s such a mature pose.. As if she knows exactly what she’s going to do in the life that lies in front of her. Wonder what she is pondering……..
Adorable photo – so nonchalant. What gorgeous photos! You have a rare talent. Beautiful work. That is too adorable. I love her pose, it’s so grown up seeming. It’s like I’m looking at her when she’s a woman, but thinking about her when she was little girl. The black and white also lends to it. I so look forward to your daily snippets, they have a way of putting a smile on someone face. This shot is a perfect example, thank you for that! “Reminds me of Schindler’s List”: you post but “Don’t Look Now” (an infinitely cooler movie), you don’t. Had no idea that Holocaust Victim was “a look”; ridiculous as it’s self-important. I see an inspired and proud dad at work. What a wonderful choc ! If this little girl were brunette, it would be me at the same age. I recognise the hair cut, dress and sandals. Is it just me or does Scott have a certain special something with his children shots? Cute. 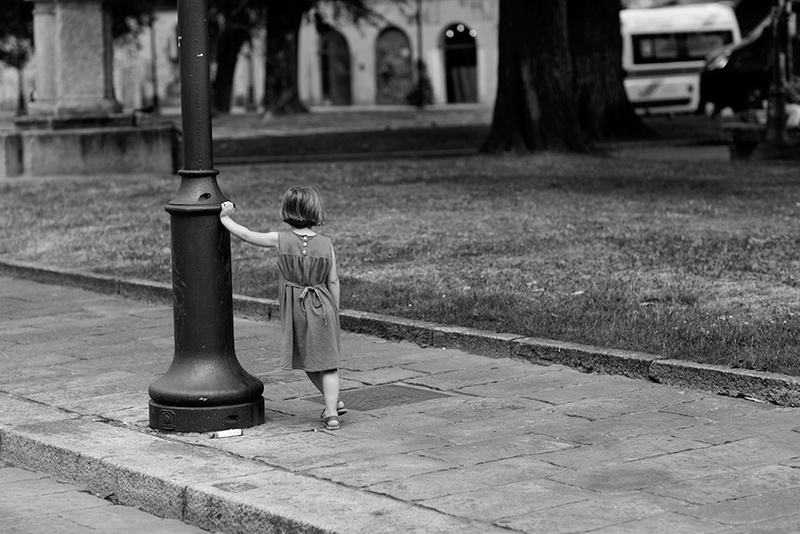 Love how the little girl is leaning onto the lamp post. this is the cutest. this kid hasn’t even hit double digits and has already mastered effortless cool. Such an innocent little cute girl! And she looks even smaller compared to the huge street lantern ! For a minute i thought I was looking at a vintage 1950s photos of an Italian child. You almost never see street pictures of children alone these days. It’s the times. A parent is lurking in the background, protectively. Case in point: I’m thinking of a 1940s-1950s pic of a young boy running from the bakery with a French baguette ..and he’s alone. I daresay he and his family lived around the corner…but you wouldn’t let a child do that now. Ever. Sort of sad..the lone child street portrait is quite compelling. Shows him/her as an individual, not just as an extension of a parent or a caretaker adult. No coy pigeon toed stance here! No self consciousnes shy stance. Just a strong confident women in the making. In comfortable stylish sandals, and that perfect stylish no-nonsense hard haircut and cooling classic summerday dress. She’s ready for a fashioable day in the park of rough and tumble fun and all takers, or a hard day of shopping with Mom. Anyone that can lean on a lampost like with such apblomb Well,Perhaps we are getting an early peek at a womens weightlifting olympian 2020/2014….or maybe a strong,sensible future Italian Prime Minister. Appreciate that photo is from back in these crazy days, and it has the advantage of creating such mystery, telling us a different story than if it were from the front. Love too so much Sott that it is in B&W. Beautifully captures timelessness of the whole scene. And thanks too for these wonderful streert by street tours you have given us all over, but especially of Milano! Really makes one feel part of your wonderful world! Reminds me of the Brassai photos. There is something very mature about the way this child is posing and supporting herself against the pole. It makes the photograph intriguing. Nice shot Scott! What a beauty! the perfect picture. What a cool little lady! Scott, you have a gift. To capture something “in the moment”, it makes me feel and think. Love when a picture can do that. Nice! I love the confidence the girl in the photo exudes. I would love to see how she grows up! The way she is standing against that post is amazing. She seems to have so much confidence. Love your B & W pics. TIMELESS A perfect “petite madame”. Black & white makes the photo look like something out of another era. She can take care of herself, no doubt about it! I love this shot to no end. This is such a classic shot. Perfect in B&W. I love this. This could just as easily have been a picture of my grandma, of my mum, of me, of my daughter. This picture is just BEAUTIFUL. I love fashion blogs, but the way this one combines vintage pics, with fashion pics, and of course urban scenes in black and white is awesome, and this one in particular held my attention for minutes. Beautiful, beautiful, beautiful pic!!! !